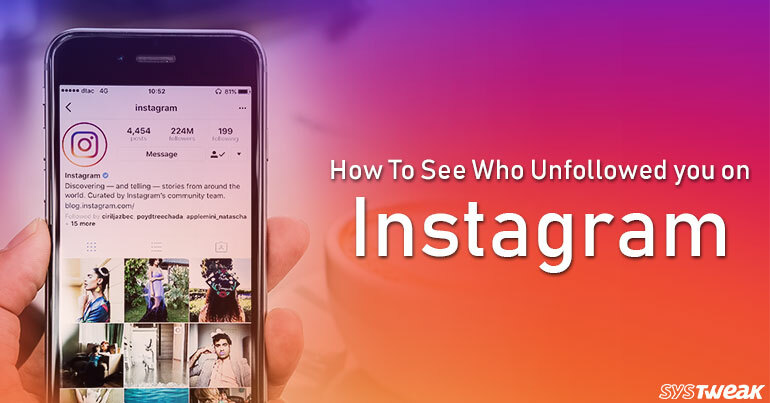 Instagram has gained immense popularity in the last few years. In this tough competition between social media giants like Facebook and WhatsApp, Instagram quite easily swept its way and established itself as a unique entity. Each social media account that we use has its own purpose. Facebook for checking the daily dose of news feed and see what’s happening around, WhatsApp for instant messaging and Snapchat for sending fun stories to our friends. Well, Instagram is quite different than that! And this happens to be one of the prime reasons why millions of users love this app. Instagram is the separate community where we interact with our friends and followers, share our life’s most beautiful moments through beautiful captures, go live with our buddies and much more. Is Instagram All About Increasing the Number of Followers? For some users, the major game on Instagram is about creating more and more followers. Obviously, your followers have full rights to see your posts or unfollow you. Social media gives this power to users where they can follow and unfollow anyone they want. But, Instagram doesn’t pop an explicit notification whenever somebody unfollows you. So, if you’re constantly worried about the decreasing number of followers on your Instagram account you can do it via third party application. Let’s see how! There are a bunch of third party apps out there that’ll give you a valuable insight into who has unfollowed you but also who you are following but who isn’t following you back. The app’s data regularly monitors your account and allows you to deeply understand who your most valuable followers are and who are just trespassers. This app gives you a quick glimpse of who recently unfollowed you on Instagram. Based on this you can also unfollow them back right through that list. Followers for Instagram is the most mainstream application for Instagram community business groups. It gives a basic insight and experience that enables brands to comprehend their entity and grow creatively based on the number of likes and followers. Who unfollowed you recently? If you happen to ask this question to yourself more than once then this is the perfect app for you. The app has a simple user interface and gives you a quick glimpse of your new followers and unfollowers, users that don’t follow you back and more. So, fellas, here were the 3 basic apps to hunt down who recently unfollowed you on Instagram account. If you’re using Instagram for business purpose then they can be quite useful to understand your audience in a better way.